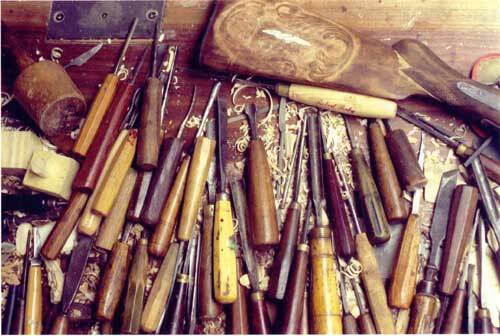 Photo by Frank Jacobs of The Trenton Times: As seen in The Times article "Carving a Niche" this photo shows a small sample of Artisans extensive collection of hand carving tools. Woodcarving and sculpture sets Artisans of the Valley apart from general cabinet and furniture makers. Producing fine quality furniture is an art form, enhancing it with detailed hand carved patterns, or sculptured legs, was traditionally a separate art. A traditional apprenticeship focused on a specific skill set, when a craftsman mastered both skills, he was a rare individual. Stanley's apprenticeship included both carving and furniture making; establishing him as one of these rare breeds. The goal now is to ensure that Eric receives the same designation. The sections under Woodcarving and Sculpture demonstrate a cross section of Eric & Stanley's abilities, ranging from furniture carving to walking sticks. If you have ideas or thoughts about commissioning a custom piece, take some time to review options for carvings. We also offer a wide variety of other unique and one of kind items, several of which are featured in this section. Clicking on the dropdown list under the Woodcarving & Sculpture heading will browse the various selections. Be sure to visit our new "Chainsaw Carving" section, added in February of 2006 featuring Master Chainsaw Carver Bob Eigenrauch. This section features freelance carving's offered through Artisans of the Valley!